Ft. Collins Public Library Archive of Article on this crash. 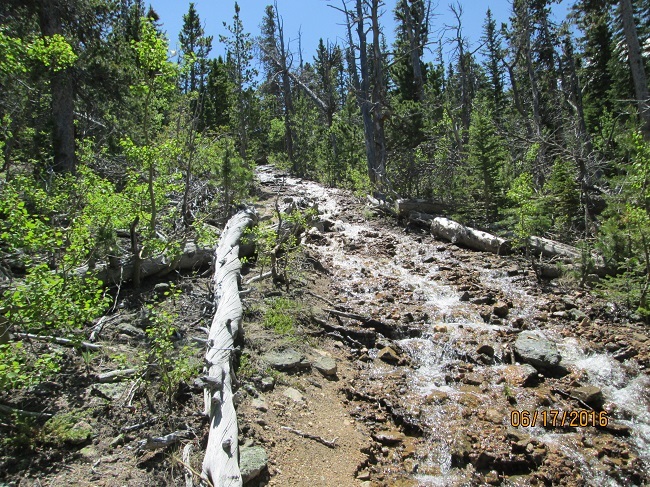 The wreck is located at the bottom of an opening created by the rockpile of a rock ridge that projects from above timberline down into treeline. Altitude is about 10500’ Local residents hauled big pieces away for aluminum scrap in the 1950's. Remaining are engines, landing gear legs, a piece of the tail and small pieces. Ft. Collins Public Library Archive of Recent Article on this crash- including map and directions. Best route The simplest route to this site is to take the Pingree Park rd to the Twin Lakes Reservoir turnoff ( 40 34’ 08.7", 105d 34’ 03.5"), take the 4WD road at the bottom of the hill which traverses the hillside to the SE and then follow that road as far as you can (I recommend stopping at the wide spot 1.8 miles in (40d 33’ 05.8", 105d 33’ 40.9"). Leave the vehicle and hike the road until you come to a bermed-off sideroad. This should be the first side spur you come to (40d 32’ 51.8", 105d 33’ 52.2") . Follow the sideroad for perhaps 3/4 mile thru several switchbacks. When it is heading NW and nearly level, there will be a footpath on the left side of the trail angling up thru the trees (40d 32’ 37.6", 105d 34’ 47.6") . Sometimes there is a wooden sign nailed to a tree here depending on what the summer camp has done that year. Opposite the trail is a somewhat overgrown flat area where it’s likely that logs were stacked and loaded. Actually, if you were to continue on the logging road, the logging road ends just 40 paces from the trail turnoff so you can backtrack to find the turn as needed. Follow the somewhat worn footpath up thru the trees to the wreck site. Update 6/28/2010- An alternative approach to the wreck might be easier than the 4WD route described above. Turn off the Pingree Park road at the same turnpoint( 40 34’ 08.7", 105d 34’ 03.5"), but go directly up the hill directly west. Halfway up is a patch of rocks which used to be carefully navigable in 2WD but now has turned fairly nasty. I actually spun the tires on my Cherokee this weekend for the first time in more than a decade. Some times of the year (not this year) you can drive around the reserovoir and can park at the southwest corner. Sometimes the reservoir is gated closed at the top of the hill. In either case, follow the logging road/trail thru the woods to the saddle at 40d 32’ 54.2", 105d 34’ 58.1" At this point there is a water diversion ditch which has a footpath alongside of it. Follow the diversion ditch to the diversion gate. Keeping on with the same general direction of travel, follow the narrow but heavily used trail thru the trees for about 50 yards where it will then pop out onto the dead-end of the logging road described above. 40 paces onward you should find the trail turnoff to go up the hill to the wreck. Note July 2003: I was pleasantly surprised to find that Twin Lakes Reservoir was FULL last month. It's the first time I'd seen that in the 19 years I'd been prowling this part of the woods. The gate is therefore closed so the Reservoir route means parking at the top of the hill at the gate and walking around the north side of the water, around the west end and joining my route at the SW corner of the water. 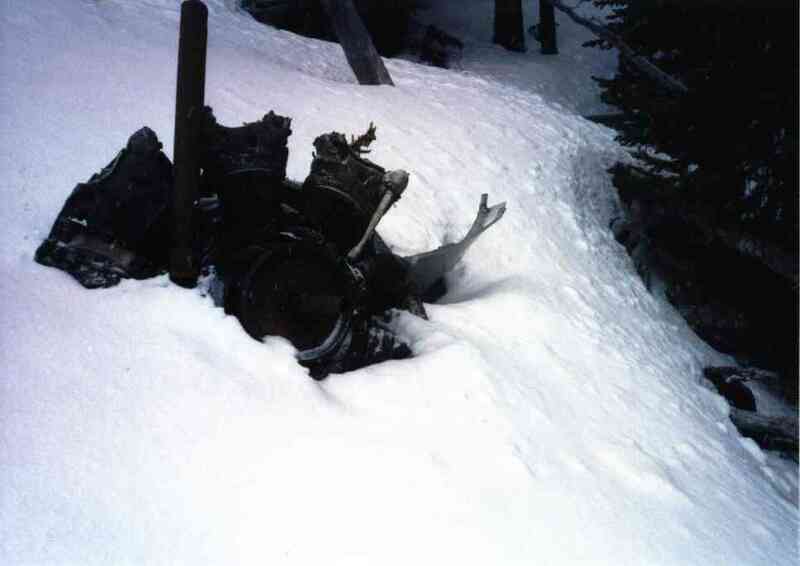 Note June 25 2006: During a visit to the site with the Colorado Aviation Historical Society we determined that the #4 engine (outboard starboard side) probably was not running at the time of the crash. The engine did not display the standard explosive dismounting of cylinder heads characteristic of radial engines which experience sudden stoppage while under power. Note May 27 2012: The reservoir is again empty. This trip I parked at the Stormy Peaks trailhead next to the CSU campus and walked up. This adds 1 mile distance and 300' elevation gain but makes the trail available to those without 4WD or high clearance. BEWARE OF OFF LEASH DOGS! This is a busy trail in summer, and so you encounter all kinds. Yesterday I met a party of folks with a pack of 5 dogs, all off-leash. The dogs were not friendly. 4 kept their distance and barked while I kept my hiking stick between them and myself. The 5th decided to show the pack he was extra tough as he beelined thru them to get to me. Fortunately I was able to put the point of my hiking stick in his face and keep him off me until the owner could put him on a leash. This is the first time I've encountered hostile dogs while hiking. Maybe it will be another 20 years before I encounter more. But I'll be a bit more prepared next time and not as trusting. Note- Aug 5, 2012. I checked to see if the High Park fire had any affect on the site or access to it. It hasn't. My info remains correct.